The current issue of the New England Journal of Medicine contains an important trial- the PEITHO trial. Its important because it tells us what not to do. 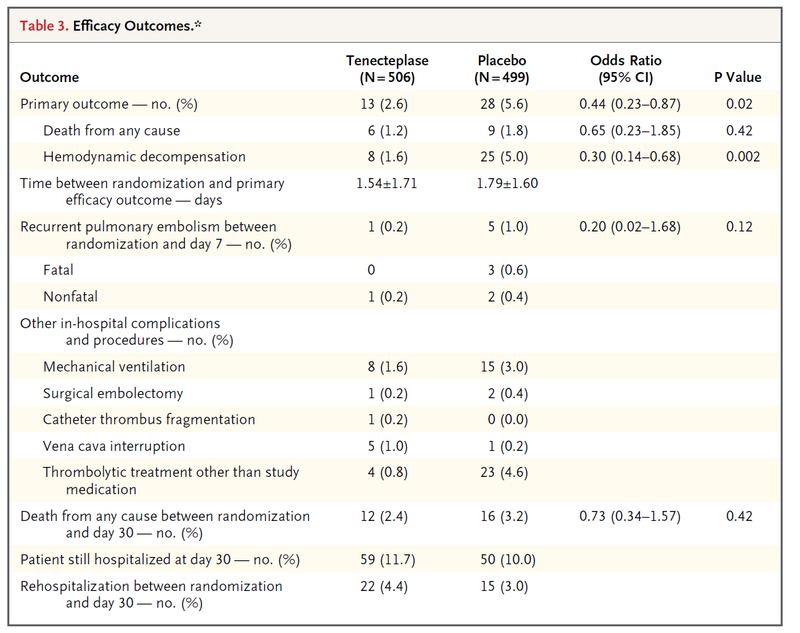 In the PEITHO trial patients with intermediate risk pulmonary embolism (right ventricular dysfunction and myocardial injury with no hemodynamic compromise) were randomized to a single weight-based bolus of tenecteplase or placebo. All patients were given unfractionated heparin. Patients were followed for 30 days for the primary outcome of death from any cause or hemodynamic decompensation within 7 days after randomization. This table shows the efficacy outcomes. Looks promising doesn’t it. The primary outcome was significantly reduced by 56%. This composite outcome is not a good one though. Patients would not consider death and hemodynamic decompensation equal. Also the pathophysiology of the 2 outcomes can be quite different. The intervention should also have a similar effect on all components of a good composite and there is a greater effect on hemodynamic decompensation than death. Thus, don’t pay attention to the composite but look at the composite’s individual components. Only hemodynamic decompensation was significantly reduced (ARR 3.4%, NNT 30). Don’t get me wrong this is a good thing to reduce. But with all good can come some bad. This trial teaches that we must pay attention to adverse effects. The table below shows the safety outcomes of the PEITHO trial. Is the benefit worth the risk? You can see from the table that major extracranial bleeding was increased 5 fold (ARI 5.1%, NNH 20) as was stroke, with most of them being hemorrhagic (ARI 1.8%, NNH 55). You must always weigh the risks and benefits of every intervention. Ignore relative measures of outcomes (in this case the odds ratios) and calculate the absolute effects followed by NNT and NNH. These are much easier to compare. Watch out for bad composite endpoints. Always look at individual components of a composite endpoint to see what was affected.